Excel 2007 is part of MS Office 2007 Package developed by Microsoft. Excel is a Windows Spreadsheet Application for performing simple calculations and developing complex applications. 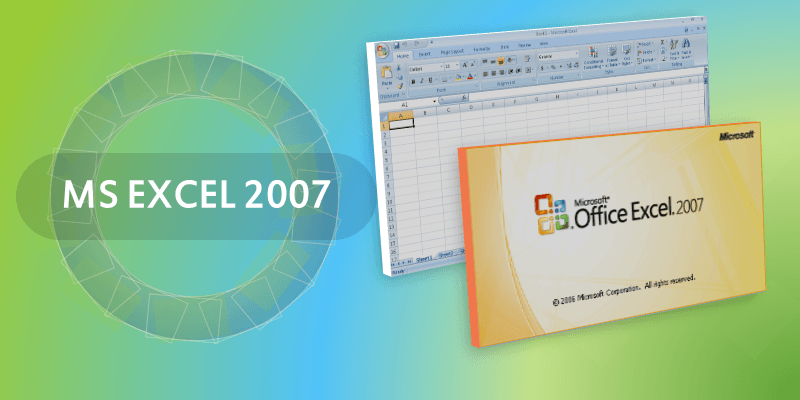 Office 2007 migrated to open xml file format from Excel 2007 version of Excel. Microsoft introduced Ribbon based menu in the Excel Interface. It is very easy to use and makes Excel Interface to look like a modern application. Microsoft Excel is increased its size of the spreadsheets. Now Excel 2007 is limited to 1,048,576 rows and 16,384 columns. So, we can enter the data in maximum of 1,048,576 records and We can have maximum of 16,384 Fields. From Excel 2007 on wards all the Excel Files are xml format by default. We can save the Excel Files with different extensions. Each extension of Excel is created for different purposes. .xlsx Excel File Format: This is the default Excel File format, when we save the file in Excel 2007 this will save as .xlsx file format. This is the normal spreadsheet to save the data, formulas and not Macros. .xlsm Excel File Format: This is Excel Macro File format, we need to save the Excel file with Macros in .xlsm format in Excel version 2007 and above. The default file format (.xlsx) does not save the Macros. .xltx Excel File Format: This is Excel Template File format, we can create spreadsheet with all required formats and save it as Excel Template. So that we can use it again when we need the same format of the template. .xlam Excel File Format: This is Excel add-in File format, we can develop the Excel workbook with most useful macros and save it as Excel Add-in. and we can develop Excel Add-in to re-use the macros whenever we need them. Formulas in 2007 version of Excel: Excel formulas in 2007 version helps the user to perform calculation in the cells of Excel sheets. Filtering in 2007 version of Excel: We can filter the data in 2007 version of Excel using Data Filter tools from Excel Menu. Charts in 2007 version of Excel: We can view the data in graphical format by inserting the Charts in the spreadsheets. Charts in 2007 version of Excel helps to quickly understand the data and get the meaningful insights from the data.